with peas. Exciting on a lot of levels, this project would give me the opportunity to do something I had no experience with before. A simple and efficient tool when growing various plants such as peas, grapes, tomatoes, beans, morning glories, honey suckles and many others. Plants like these are viny and wiry, they like to spread out, but can end up sprawling across a field dragging their fruit behind and weakening making them more susceptible to pests and pathogens if not properly trained. Plants with tendrils such as peas and grapes are incredible plants with thready snake-like appendages that twist and curl around anything they can grasp. 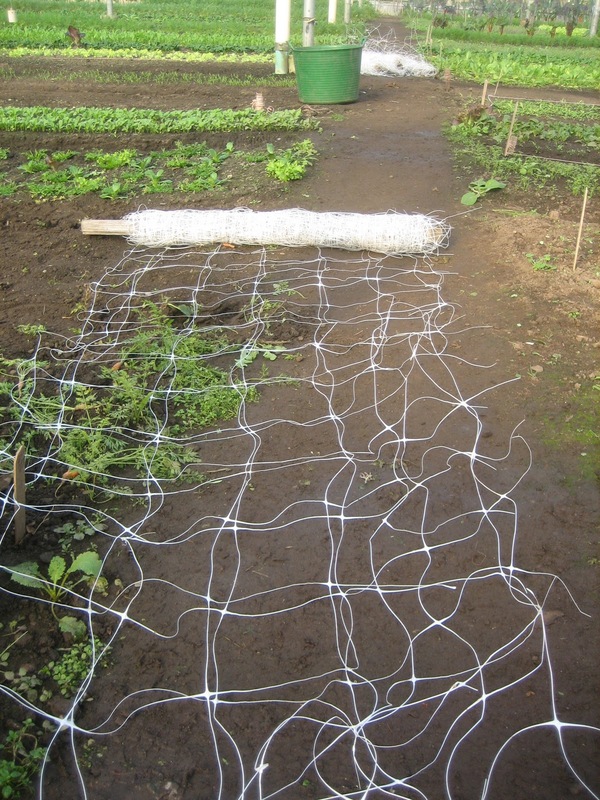 Building a trellis is so important so that there is a simple structure the tendrils can climb, keeping the fruit nice and clean, off the ground and away from fungus, pathogen pressure and pests. 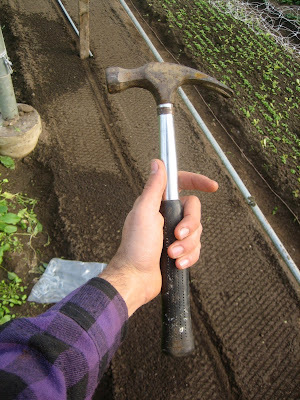 Lucky for me, I am working on a farm that has done this before so finding the materials was easy. Nevertheless all you need is some wooden stakes (2'' x 4'' will do) and some netting that the tendrils can clasp and climb up. 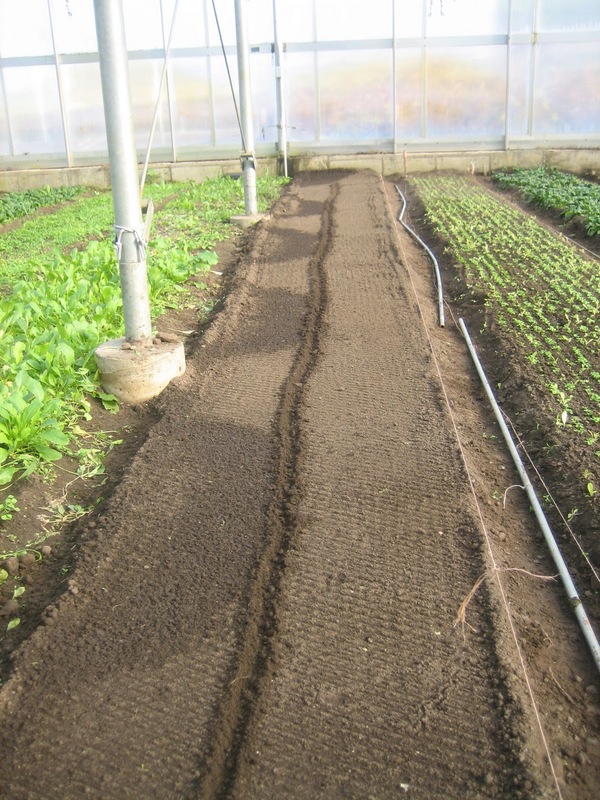 First I measured out the length of the bed (34" in this case) and measured a "straight" line down the middle so I would have even space for pea plants on both sides of the trellis. It's not pressing that you use both sides, but it is a more efficient use of space. I placed 4 wooden posts 10 feet apart, which was the size of my metal ridge bars, so it all depends on how you build the trellis. 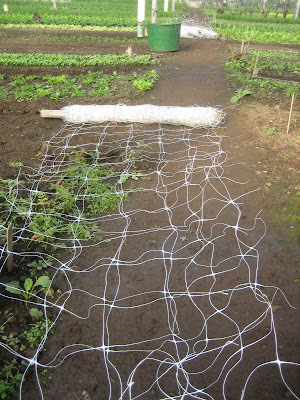 Once everything was sturdy and in place, I pulled the plastic netting over both sides and stapled it in tightly. A simple concept, yet incredibly validating. Measuring 12'' apart and 6" from the trellis on both sides respectively, I transplanted a 10' block of purple "Sugar Magnolia" sugar peas followed by a 10' block of green "Oregon Giant" snow peas and a final 10' block of "Carruthers" purple podded peas. The idea here is that by having the green, delicious, broad, tender-shelled, sweet Oregon Giant peas surrounded by both varieties of purple peas, we will be able to see which purple plants mate successfully with the green. Our goal is to get the first delicious, tender, sweet purple tender-shelled sweet tasting pea. As of now the purple peas, although beautiful, have too tough a shell to eat. It's extremely satisfying to be a part of such a cool and interesting experiment. My first plant breeding trial, one of many I believe. So, how did this turn out? I would have thought the Sugar Magnolias would have been a great pea. Last year i trailed Midnight Snow (a very soft purple snow pea), and this year i am going to trial Sugar Magnolia and the new Shiraz pea (all purple snow and/or snaps). First, thanks for checking us out and writing in. As far as the trial, the peas are just starting to climb the trellis. I imagine we will have at least another month or so before we start seeing any peas, but I will definitely be providing updates when that happens. I'm not familiar with Midnight Snow, do you have any pictures? Sounds awesome, maybe I can get some samples to try. Are you growing in the Northeast? The Oregon Giants are unbelievably flavorful and sweet, I'm interested to see if we can get those in purple. More to come and keep us updated on your new trials this year. No I'm actually over here in N. Colorado. Here is the best picture i have of Midnight Snow (http://farm7.staticflickr.com/6097/6289481409_9915f53e0c.jpg), it's supposed to be a true snow pea bred by Dan Quikert in California. Unfortunately his website is down (purplepeas.net). I'll try growing some more out this year, and after i harvest more seed i could probably send you some. The Giant Sugar peas sound awesome, I just acquired one called bijou that is probably similar to the Oregon Giants. It would indeed be neat to do some crosses with those. Several of us on the Homegrown Goodness forum (http://alanbishop.proboards.com/index.cgi?board=beans&action=display&thread=1772&page=1) are also trying to breed our own red-podded peas. Breeding Sugar Magnolia with Opal Creek should produce a very nice red-podded pea. Yes, Please do. I look forward to coming back and seeing some pictures. I'll try to come back and let you know how my own pea trials come along as well. In the meantime you can visit my makeshift website if you want (http://biolumo.com/peas.html). Great pics here and thanks for sending over your website. Such perfect timing too. The pictures/descriptions of those green,purple and yellow peas are a great resource and I've been meaning to dive deeper into Mendel so I appreciate the "Details of Mendel's Plant Breeding" section a lot right now. I'll be back with some updates soon Keen. Thanks again.